I cannot believe it has been three weeks since we welcomed sweet Baby Boy into the world! Where does the time go? Life has been pretty hectic lately, as anyone who has ever had a baby can attest, but I hope to resume regular blogging soon. In the meantime, here is a picture of my little angel… Please follow me on Instagram for more. Photography by Emily Allongo Photography. Bow swaddle from the Beaufort Bonnet Company. What a beautiful baby! Congratulations! He's divine!! He is so beautiful! Wishing him much health and happiness – congratulations to your family! Congratulations!!! I was just thinking about you and wondering if he was here yet! So precious!! Your handsome boy is already modeling. 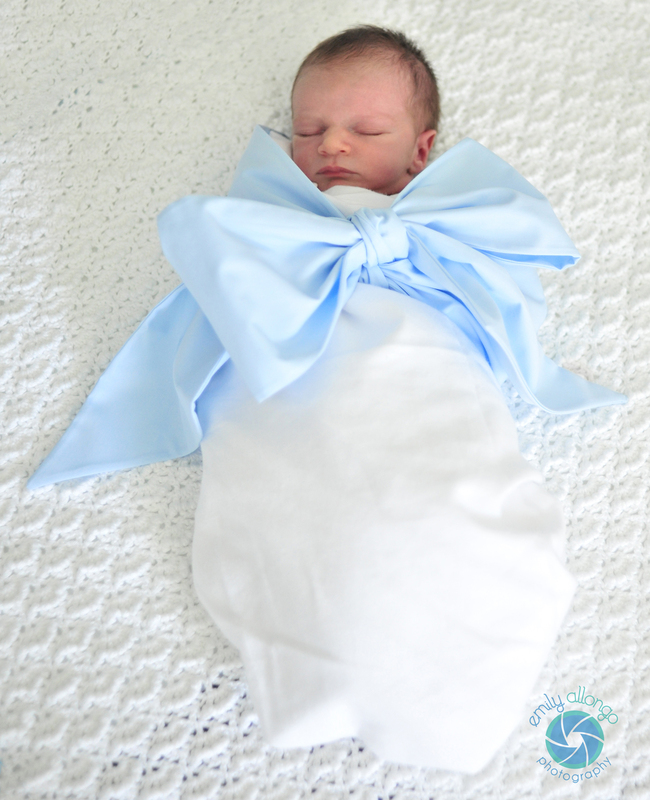 Love the bow swaddle and your precious bundle of joy! Enjoy your cocoon now. We'll be here waiting for more updates when you are ready. Congratulations, Andrea! SOOO cute! Congratulations….he is finally here. You must be over the moon, it is such a magical time. Enjoy every precious minute!! So precious! Enjoy every sweet and crazed moment my sweet friend! He is absolutely perfect!!!! Congratulations to you all!!!! i am late in congratulating you on this little bundle of joy, just precious beyond!! OMG he is sooo cute! Congrats and as said before- enjoy every hectic minute- they grow up sooo fast. Oh my gosh where have I been , he is beautiful! Good luck and enjoy!